LAST WEEK, OCTOBER 7, 2015 WE WROTE AN ARTICLE ABOUT HOW IT’S EASIER TO BUY A GUN THAN GET A DRIVERS LICENSE. We want to share the responses we received from Vero Beach, Florida that extend to Antlers, Oklahoma, Dallas, Texas and all the way to Vancouver, Washington. These are the people you want to create an entire new, massive organization that will know where every freakin’ gun is in the country and will wield greater power over who gets what kind of guns? Why not use a common sense profiling technique rather than increase the reach and cost of big government? If we profiled terrorists in this country, we wouldn’t have an over-reaching TSA (a massive employment project) costing millions in personnel and equipment. Instead we search/frisk, thousands of grandmothers and children while the only people to terrorize the country fit a narrow profile. “Stop and Frisk” used profiling and reduced violent crime in NYC until the new Socialist mayor came on board. Take a look at the hand full or people who have killed people in public (no gun zone) locations and see if you had all of these suggestions in place if you really would have stopped the violence. In fact, if all of the existing laws were enforced, much of what you suggest would be accomplished and there would still be problems. Why punish 99% of the law abiding population, create a new, expensive government program, and take away peoples’ constitutional rights (something not mentioned at all in your article) for less than 1% of the population. A national registry is a great idea. However, the NRA would attack such a plan by screaming, “The government wants to take away your guns!” and other such ludicrous claims. The brutal fact is that the NRA owns Congress and any legislation that looks like gun control will be “shot down” by the gun lobby. Its argument is that the best cure for gun violence is more guns. Funny, but the logic escapes me; more guns means more bullets which means more holes in people. The Second Amendment phrase, “A well regulated Militia,” has been twisted and essentially ignored by the right-wing that sees regulation of any stripe as anathema to individual rights. The common good has been abandoned in favor of campaign money from special interests. Then again, these two news stories say it all. A woman opens fire on a shoplifting suspect. I guess we all can be cops today. The horror in Inglis, FL that unfolded over a few minutes time has become so mundane, so everyday, that it no longer makes national news. This article is complete BS. 16 year olds need driving school, etc. Getting your first license is different because you are out there DRIVING. Only an ignorant (bleep) can’t recognize the difference between a constitutional right and a privilege. Anyone who thinks the government should decide what the people should be allowed to do doesn’t understand what the founding fathers set in motion. There are other countries you can move to if you don’t like this one. 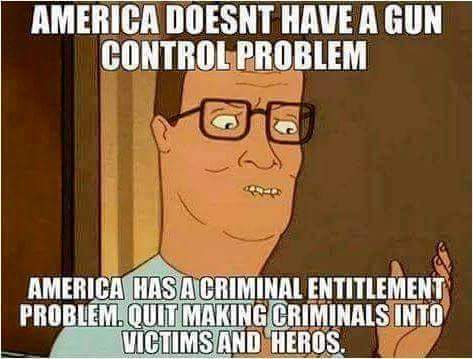 That’s why guns are a right and driving is a privilege. This is why I live in the United States. Perhaps the first reader is right; on which we may all agree. All we need is “more big government to solve the problem.” But then again there are those who believe we don’t have a problem.